Figure_composer_output shows the Print Composer with an example print layout, including each type of map item described in the previous section. Before printing a layout you have the possibility to view your composition without bounding boxes. This can be enabled by deactivating View ‣ Show bounding boxes or pressing the shortcut Ctrl+Shift+B. The Print icon allows you to print the layout to a connected printer or a PostScript file, depending on installed printer drivers. The Export as SVG icon saves the Print Composer canvas as an SVG (Scalable Vector Graphic). The Export as PDF icon saves the defined Print Composer canvas directly as a PDF. Clicking the Export as image icon will ask you to enter the filename to use to export composition: in the case of multi-page composition, each page will be exported to a file with the given name appended with the page number. You can then override the print resolution and the exported image dimensions (set in Composition panel). If the composition includes a single page, then the output is resized to include EVERYTHING on the composition. The page can then be reduced or extended to all items depending on their position (on, above, below, left or right of the page). In case of a multi-page composition, each page will be resized to include items in its area (left and right sides for all pages, plus top for the first page and bottom for the last page). Each resized page is exported to a separate file. 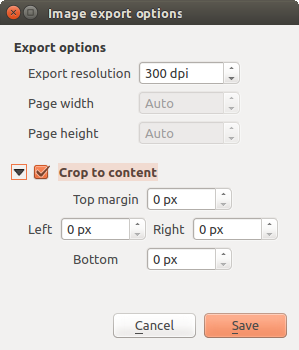 The Crop to content dialog also allows to add some margins around the cropped bounds. If you need to export your layout as a georeferenced image (e.g., to share with other projects), you need to enable this feature under the Composition Panel. If the output format is a TIFF format, all you need to do is making sure to select the correct map item to use in Reference map, and the output will always be a GeoTIFF. For other image formats, you also need to check the Save world file option. With this option, the ‘Export as image’ action will create a world file along with the exported image. Exporting large rasters can sometimes fail, even if there seems to be enough memory. This is a problem with the underlying Qt management of rasters. With Export as SVG, you also need to fill the filename (used as a basename for all files in case of multi-page composition) and then can apply Crop to content option. Currently, the SVG output is very basic. This is not a QGIS problem, but a problem with the underlying Qt library. This will hopefully be sorted out in future versions. The Export as PDF exports all the composition into a single PDF file. If you applied to your composition or any shown layer an advanced effect such as blend modes, transparency or symbol effects, these cannot be printed as vectors, and the effects may be lost. Checking Print as a raster in the Composition Panel helps to keep the effects but rasterize the composition. Note that the Force layer to render as raster in the Rendering tab of Layer Properties dialog is a layer-level alternative that avoids global composition rasterization. If you need to export your layout as a georeferenced PDF, in the Composition Panel, make sure to select the correct map item to use in Reference map. 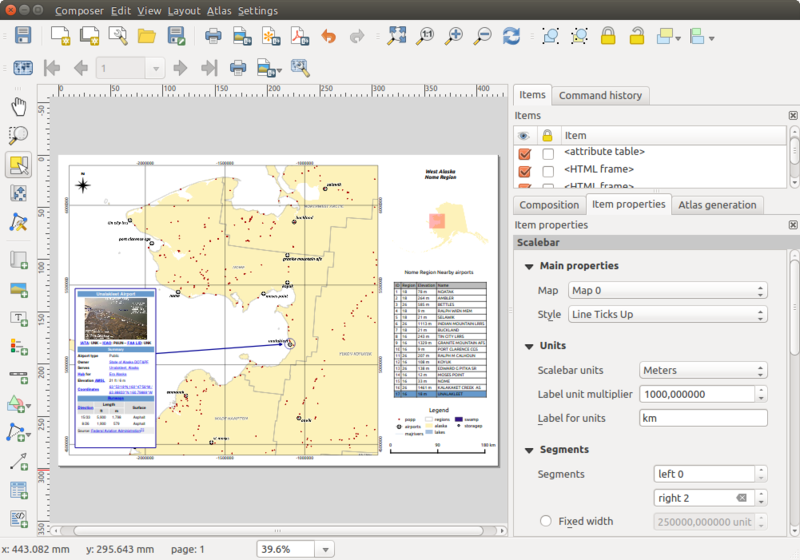 The Print Composer includes generation functions that allow you to create map books in an automated way. The concept is to use a coverage layer, which contains geometries and fields. For each geometry in the coverage layer, a new output will be generated where the content of some canvas maps will be moved to highlight the current geometry. Fields associated with this geometry can be used within text labels. Generate an atlas, which enables or disables the atlas generation. A Coverage layer combo box that allows you to choose the (vector) layer containing the features on which to iterate over. An optional Hidden coverage layer that, if checked, will hide the coverage layer (but not the other ones) during the generation. An optional Page name combo box to give a more explicit name to each feature page(s) when previewing atlas. You can select an attribute of the coverage layer or set an expression. 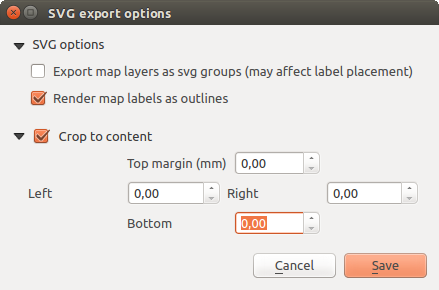 If this option is empty, QGIS will use an internal ID, according to the filter and/or the sort order applied to the layer. An optional Filter with text area that allows you to specify an expression for filtering features from the coverage layer. If the expression is not empty, only features that evaluate to True will be selected. The button on the right allows you to display the expression builder. An optional Sort by that, if checked, allows you to sort features of the coverage layer. The associated combo box allows you to choose which column will be used as the sorting key. Sort order (either ascending or descending) is set by a two-state button that displays an up or a down arrow. An Output filename expression textbox that is used to generate a filename for each geometry if needed. It is based on expressions. This field is meaningful only for rendering to multiple files. A Single file export when possible that allows you to force the generation of a single file if this is possible with the chosen output format (PDF, for instance). If this field is checked, the value of the Output filename expression field is meaningless. A Margin around feature that allows you to select the amount of space added around each geometry within the allocated map. Its value is meaningful only when using the auto-scaling mode. A Predefined scale (best fit). It will use the best fitting option from the list of predefined scales in your project properties settings (see Project ‣ Project Properties ‣ General ‣ Project Scales to configure these predefined scales). A Fixed scale that allows you to toggle between auto-scale and fixed-scale mode. In fixed-scale mode, the map will only be translated for each geometry to be centered. In auto-scale mode, the map’s extents are computed in such a way that each geometry will appear in its entirety. There are several places where you can use a Data Defined Override button to override the selected setting. These options are particularly useful with Atlas Generation. 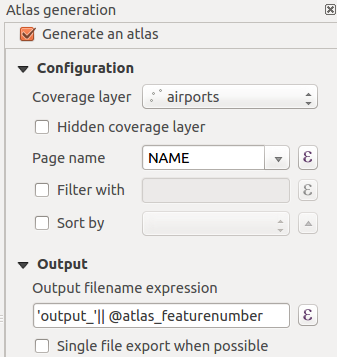 For the following examples the Regions layer of the QGIS sample dataset is used and selected for Atlas Generation. We also assume the paper format A4 (210X297) is selected in the Composition panel for field Presets. With a Data Defined Override button you can dynamically set the paper orientation. When the height (north-south) of the extents of a region is greater than its width (east-west), you rather want to use portrait instead of landscape orientation to optimize the use of paper. For all other composer items you can set the position in a similar way so they are correctly positioned when the page is automatically rotated in portrait or landscape. Information provided is derived from the excellent blog (in English and Portuguese) on the Data Defined Override options Multiple_format_map_series_using_QGIS_2.6 . This is just one example of how you can use the Data Defined Override option. You can also use the combo box to directly select and preview a specific feature. The combo box shows atlas features name according to the expression set in the atlas Page name option. As for simple compositions, an atlas can be generated in different ways (see Creating an Output for more information). Instead of Composer menu, rather use tools from Atlas menu or Atlas toolbar. This means that you can directly print your compositions with Atlas ‣ Print Atlas. You can also create a PDF using Atlas ‣ Export Atlas as PDF...: The user will be asked for a directory to save all the generated PDF files, except if the Single file export when possible has been selected. In that case, you’ll be prompted to give a filename. With Atlas ‣ Export Atlas as Images... or Atlas ‣ Export Atlas as SVG... tool, you’re also prompted to select a folder. Each page of each atlas feature composition is exported to an image or SVG file. If you want to print or export the composition of only one feature of the atlas, simply start the preview, select the desired feature in the drop-down list and click on Composer ‣ Print (or export... to any supported file format).